Our last three days in Rajasthan we spent in the delightful town of Udaipur, where we undertook three cooking classes with the talented Sushma. 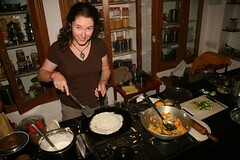 It was one of the best things we did on this trip - as we learned how to make all the wonderful Indian foods we've been getting fat on, like masala dosa, paneer butter masala, aloo gobi, mulligatawny soup, naan bread, uttapam, chapatti and stuffed paratha (to name just a few dishes). Be warned, dear friends, an Indian food cooking challenge will be issued when we return, and we're going to need guinea pigs! 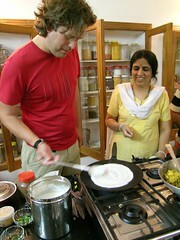 In this shot, Phil is demonstrating his dab hand at making the lentil/rice pancakes for masala dosa (also happens to be one of his favourite meals). Note Sushma's smile of approval. Tough togas, lady, he's mine.